Since the founding of our nation, many of our greatest strides, from gaining our independence to abolition of civil rights to extending the vote for women, have been lead by people of faith. Trump spoke those words at the National Prayer breakfast, an annual assembly of our nation's "Christian" leaders. 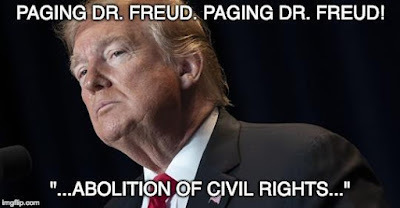 "Abolition of civil rights." To be fair, and I'm always fair, I don't think he consciously meant to say that. I think he misspoke, but, sometimes when you misspeak, you are simply expressing a thought that lies at the forefront of your mind. Call it a Freudian slip. Trump has spent a lifetime showing us that bigotry is one of his core values. This Freudian slip, or whatever you wish to call it, triggered a ton of twitter snark about Trump being honest for a change, etc. Maybe he just feels uncomfortable in front of today's Republican Jesus folks and it just awkwardly came out. Or, maybe there is some consciousness in his dark, feeble brain that the bulk of today's Christians are indeed advocates for the "abolition of civil rights." Just ask the LGBTQ community, or just ask those "Christians" who back politicians who work tirelessly to deny voting rights for African-Americans and get their rocks off by supporting the placement of children in cages. It all makes sense; when it comes to the "abolition of civil rights." Trump and today's "Christians" seem to be of one mind, sick as that mind is. It's worth noting that the audience cheered. Examples of the religious throttling of individual rights abound throughout history. Some of the worst offenders are those who boldly display their faith as they kill and destroy. One must question whether Yeshua the Nazarine hasn't returned as his "followers" fervently desire because they clearly haven't understood the message he left behind for them. got news for 3:06... yeshua never existed. He's no more real than peter pan. but truer words were never written. humankind has been buggering itself throughout history via people of faith doing the buggering in the name of their deity. Whether Yeshua really existed is made moot by the corruption of the religion by Saul of Tarsus, who so corrupted the religion with reactionary BS that it ceased to resemble anything that the tentative Messiah intended. It is ever worse than even that today.